When ordering FlexiFelt floor protectors measure the length and width of chair legs that are square or rectangular and the diameter for round legs. If the legs change size in the first inch from the floor, take the measurement at ¾” from the floor. The 6825 and 6835 models require a different technique. If they are fitted on a round leg, simply push them over the leg. For a square or odd shape leg, you can roll the Flexi-Felt sleeve down to its base, apply the rolled Flexi-Felt to the footing of the chair leg, then unroll it onto the leg. If you have difficulty rolling the sleeve down, either rinse the sleeve with water hot enough to soften it, taking care not to wet the felt or warm the sleeve with a hair dryer. The Flexi-Felt® will mould perfectly to the furniture leg. BEFORE ATTACHING FLEXIFELT PADS TO THE BASE OF THE CHAIR LEGS, THE AREA SHOULD BE THOROUGHLY CLEANED (PREFERABLY WITH RUBBING ALCOHOL) .THE PADS SHOULD BE PRESSED INTO PLACE AND THEN THE CHAIRS LEFT FOR A COUPLE OF HOURS TO ENSURE COMPLETE ADHERENCE TO THE LEG BASE. AN IRON ON LOW SETTING COULD ALSO BE PLACED ON THE PAD FOR A FEW SECONDS TO SOFTEN THE ADHESIVE SLIGHTLY PRIOR TO REPLACING THE CHAIR IN AN UPRIGHT POSITION. Not all caster wheels are made the same. We are not just talking about the obvious difference which is that some have an axle in the middle of the wheel with a bracket over it. We're talking about the regular caster wheels that you have on casters of office chairs. There’re usually two wheels that make up these casters with a cover or fender like a bike wheel has. We learned that they’re not all made flat so that you have a flat smooth surface that rolls over the floor. Apparently, some manufacturers make them with an edge which makes un-moulding the wheels much easier during manufacturing. However, once installed on a chair, the chair is actually rolling on edges and not flat surfaces. Think of what this is doing to your floors. 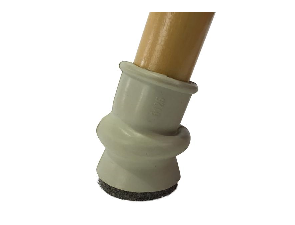 If your floors are getting quickly damaged it may not be just the standard caster wheel causing the damage but the edge that the wheels are riding on. What can you do about this? Flexi-Felt has Caster Covers which help protect floors from hard flat nylon wheels but unfortunately, they don’t help those with the edge. The edge ends up cutting the Caster Cover. Just goes to show you what it can do to floors. So, if you have chairs with these types of wheels, the only option is to replace the entire caster. If you go with new hard nylon casters, make sure to use the Caster Cover to protect the floor from the nylon wheel. 6100 series have a bulge partway down the tube. This bulge acts a bit like an elbow. For angled chair legs you put the chair leg part way into the 6125, then you place the felt bottom flat on the floor. After that you push the chair leg all the way to the bottom. This should result in the felt laying flat on the floor for even wear of the felt. These can be used for angled or vertical legs..
Place chair on a paper and draw a line each side of the tubing where the sled will fit. Measure the distance between the two lines and that measurement will be the size you need. If the measurement falls between two sizes you will need the larger size. Any slight slack can be compensated for by wrapping clear tape round the tubing, to ensure a snug fit.